In the end, though, the experience that No Man’s Sky offered ended up being disappointing as the initial sense of wonder faded away quickly after discovering that most planets in the game were actually quite similar, while the first-person shooting and dogfighting in the game got old quickly too. But thankfully developer Hello Games has continued to support the game after its launch last August and even prior to its release as No Man’s Sky did get a massive day one patch. Although that one pales in comparison to the new “Foundation update” just released by the developer, which could be the start of great things to come for the game. This patch adds several new game modes. These include a “Normal mode”, which is the default experience, and a “Creative mode” which gives players complete freedom to explore the universe and build as big a base as they want. And like quite a few games these days, No Man’s Sky also has a “Survival mode” now, which makes enemies harder to beat and staying alive on the game’s planets more difficult, offering players the ultimate challenge in the game. Perhaps the most interesting new feature in this latest patch is the new base-building gameplay, which enables players to build an outpost on a planet and recruit alien lifeforms to carry out research. It is also possible to fast travel to one’s base, even if this takes some of the joy out of exploring the game’s universe though, while resources can now be stored in interstellar freighters which players can purchase in the game. 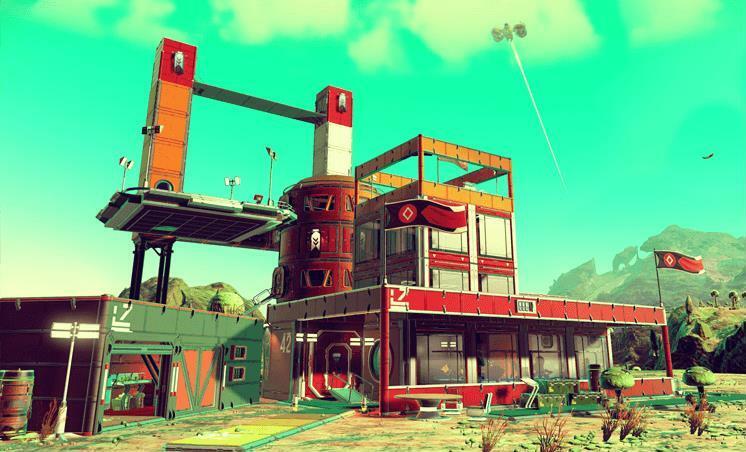 No Man’s Sky now lets you build a fully-functional base on a planet of your choice. This latest patch also looks likely to make exploring the game’s planets more appealing by increasing the number of “lush and tropical” planets as explained on Hello Games’ website. There are also a bevy of visual improvements including motion blur and temporal anti-aliasing, which at least should make looking at No Man’s Sky on a big widescreen TV a more pleasing experience. Of course, some may argue that this latest update is a case of too little too late, and since the game shipped more than three months ago most players may have already abandoned the game for good. And it’s not like we haven’t seen plenty of good games in the final quarter of this year, making this admittedly hefty No Man’s Sky update more an act of good will to existing owners of the game than anything else. But still, here’s hoping that this patch and future ones bring the game up to speed, delivering an experience closer to what was originally promised for those players who decide to pick up the game in the future. Next: Should you be playing Pokémon Sun or Pokémon Moon instead of Pokémon Go?